An extension cord could be a big help when you need that extra bit of reach in your power cord. ALEKO's extension cord is a high quality, efficient, and reliable way to extend the reach of your outlets to your TV, game consoles, coffee makers, and more. The cord is ETL certified, abrasion and deterioration resistant, so it's reliable both indoor and outdoor and will last a long time without needing to be replaced. The bright orange color acts like a beacon even in low light situations, so you won't trip over it or misplace it at night. Works great in your home, farm, or shop, or even in your RV or mobile home. 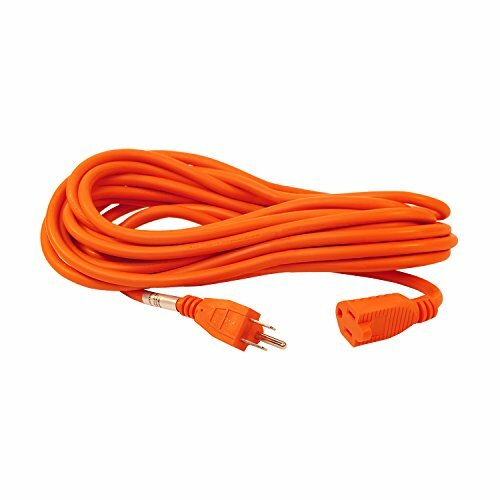 Technical Specifications: 20 foot long, 16/3 gauge SJTW cord; 15 amps 125 volts 1625 watts; Color: Orange.